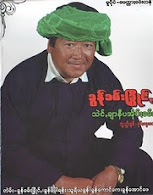 Taunggyi Time (ေတာင္ႀကီးတုိင္းမ္): A BURMESE PERSPECTIVE: Will the Foreign Policy Success of Obama place Burma in the Proxy Hot War? Next year’s elections will be a key indicator of how Burma wants to move forward, with many an assessment of the reform process hinging on the outcome “all in” on a questionable hand? Among those who will be keenly watching the election returns will be no doubt President Barack Obama, as his stakes are the highest in its foreign policy barometer, as underneath all the rhetoric of democracy, human rights, and free and fair elections, land grabbing, crony economy there is major US commercial and strategic interest in resource-rich country with a growing energetic young population vis a vis China. American businesses are coming to Burma in what looks like an increasingly unstoppable tide, and to facilitate investment, most of the blacklisted tycoons will be whitewash as Secretary of State Kerry demonstrated by putting up in a blacklisted tycoon’s hotel. It is also known that a senior State Department official met privately with some of these tycoons, known by their acronym as SDNs (Specially Designated Nationals) telling them to put forward a request to have their names cleared. At least in name they would have to sever ties with the military, avoid involvement in land seizures and respect civilian rule. And they will be removed from the blacklist, having been sufficiently rehabilitated in the eyes of US officials at the Treasury Department. But whether they would be posthumously be granted to the two gentlemen of Rangoon (Khun Sa and Lo Hse Han) is still to be seen. However, Canada has rolled out the red carpet welcome to Lo Hse Han’s son Stephen Lo. Such is the North-American standard of “Business always overrules the conscience”, the established arsenal of democracy. But it is a fact that 58 percent of Americans disapproving of his foreign policy, according to a June poll, claiming credit for the move toward democracy, such as it is, won’t sit well with the skeptics who assert that reforms remain incomplete and the military and its former generals are still calling the shots in a country that is far from a success story. Many in the dissident’s circles have warned that there should be a Plan B. Indeed, many Burmese were counting on the United States to inject some life into a reform program increasingly viewed as stalled. Whatever, lingering moral authority remaining in the administration of Barack Obama may fell to dust. In a country like Burma; one is immediately struck by the staggering glibness that tore a great many people to pieces, among them many innocents, particularly the non Myanmar ethnic nationalities. As bad as the "some folks" gambit was, this, this right here, is where the moral authority of the American president and his administration became a dumpster fire. The moral failure on Burma in this is so vast as to be bottomless. President Obama isn't going to get any static from them on the issue; which the Myanmar had inflicted on their enemies. President Obama has done nothing to bring those responsible to justice surely he knows that former Generals now in mufti, have never admitted their mistakes, nor asked for forgiveness, let alone punishing them, this explicitly means that they will repeat the same atrocities, as they had done for more than half a century, if things doesn’t go their way. Now by lining up with and defending these Generals, he has added his name to the roll call of shame that continues to dishonor the American nation whose hall marks is democracy and human rights. The cruel and despicable a practice which the Burmese Junta has imposed on its own people is not yet lost and it acted that these people are the "real patriots." “The administration can do more on this issue. As we tie a nice bow on what we call a success story, we need to make sure we aren’t a cheap date when it comes to human rights.” said representative, Jim McGovern of Worcester. And warned conditions in Burma had taken “a sharp turn for the worse” and urged more restrictive measures, such as targeted sanctions. More than 70 lawmakers signed on, including all House members from Massachusetts. The Worcester congressman pushed a separate resolution through the House in May that highlighted the Bangali’s (Rohingya) plight, a move he labeled a “friendly reminder” for the White House. Unblemished it is no more. The legalised assault on Unity Journal’s brave journalists was just like the bad old days. Courageous journalism who had known all the time that the Tatmadaw has used chemical weapons against the ethnic freedom fighters was made bare. Now in Burma suddenly became very much harder to report the truth because as I have often described that the corner stone of the Tatmadaw was “To tell lies against the very concept of truth.” is their unwritten rule in the Tatmadaw. Now that the sanctions are all gone but the job of reform is only half done? In the past three months, a coalition of opposition forces has been holding rallies to demand radical reform of the 2008 Nargis Constitution, designed to cut back the dominating role of the military – they hold 25 per cent of parliamentary seats, and remove the arbitrary rule that prevents Daw Aung San Suu Kyi from running for president. A petition demanding these changes has gathered five million signatures. 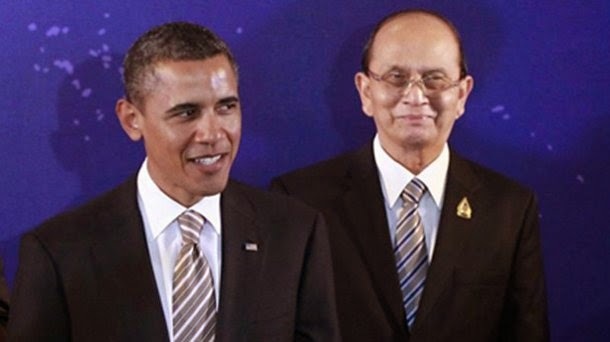 But Thein Sein and his colleagues have shown no interest whatsoever in even discussing them and yet President Obama is said to be considering a second visit later in the year to this lonely outpost of presidential achievement. As the United States insists that military engagement with Burma is crucial to promote political reforms, human rights activists and ethnic nationalities are raising who will take responsibility if US assistance to Burma’s armed forces is used to oppress, rather than help, the Burmese people? The ethnic nationalities combined together which formed the majority of the population has been victims of brutal military campaigns and have sent a letter to the US Consulate in Thailand’s Chiang Mai last month, saying they believed US military engagement in the country was premature. “We don’t even know what will happen in 2015. We don’t know whether the election will be free and fair. Now, proportional representation (PR) is being debated and we don’t know how things will develop,” said Khun Htun Oo and there is every possibility that the American technologies will be used for ethnic cleansing as they have done in the past. The classic example is the Tatmadaw has signed bilateral ceasefires with most ethnic armed groups since 2012, but over the past three years clashes in northern Burma have left more than 100,000 people displaced. Cherry Zahau, an ethnic Chin human rights activist accused the US that it is due to the geopolitical importance of Burma for US national security and that the Tatmadaw has continuously been a hindrance to reforms by waging battles “It is ridiculous that the US is engaging with the Burmese military to encourage reforms,” she said. Daw Aung San Suu Kyi is also very disappointed with US policy in Burma, especially its policy of military-to-military engagement. Not only the United States, but also the United Kingdom and Australia appear convinced that military engagement is crucial in this time of political reform. They have all already sent military leaders to meet with top-brass officials from the Tatmadaw, Obviously, the Obama administration and other Western countries are eager to work with Burma’s quasi-military government (if they can work with Assad of Syria in face of ISIS threat Burma is a small fry). After half a century of military dictatorship, their rationale is that they want to encourage political reforms and more equitable development for the country’s people. Daw Aung San Suu Kyi and other dissident leaders clearly do not oppose these goals, or the diplomatic engagement that is likely necessary to achieve them. But whether the international community should go so far as to engage with Burma’s military is a major question, especially lately, when it increasingly appears that the government’s political reforms have stalled. In the past, when Suu Kyi said something, world leaders listened. Their policy reflected well on her words. But now, the situation is different. It is sad to witness that these days, Washington and other Western governments seem to need Thein Sein more, while Suu Kyi is becoming a mere symbol for the international community. Foreign diplomats aren’t missing meetings with the Nobel Peace Prize laureate, but their meetings are more and more appearing as courtesy calls. It is important to listen to both sides. Burmese officials are skilled manipulators, that genuine democracy is not on their agenda, and that the military here still enjoys economic and political privileges. If the United States and others in the international community do not pay attention to these warnings—if they continue to court the president and the armed forces—sooner or later they will witness a proxy hot war. It’s a pity that Obama and his experts did not know what is the crux of the Burmese problem? The Myanmar race which control the imperial Tatmadaw wanted to colonise all the non-Myanmar ethnic nationalities and that is the sole reason of the struggle as every ethnic race in Burma is fighting against the Myanmar dominated central government (note there is no horizontal struggle between the ethnic like in former Yugoslavia). A vertical struggle indicates that all these want some sort of genuine federalism. More than half a century since 1962, the Myanmar military dominated central government refused to grant them and now because of the unsurmountable pressure from China it has no choice but to go along with the Western democratic standards and began to negotiate grudgingly with the ethnic nationalities. The successful “Divide and Rule” policy of the Burmese government was able to coax the Southern Alliance composed of Karen, the Chin, the Mon, the Karenni and the Southern Shan and the All Burma Student Democratic Front to a cease fire after bribing their leaders outright and giving them some autonomy and economic incentives, however, the Northern Alliance composed mainly of Kachin, WA, the Palong (Tang), the Nagas, the Northern Shan and perhaps the Arakanese want genuine federalism and once it is clear that the Myanmar will not grant them may form their North Federal Military Alliance to resist the pressure. What proof is more wanted when the Central Government has waged an all-out war against the Kachin? Mr. President, the ethnic nationalities of Burma desire genuine federalism within the Union of Burma and does not want to be a slave in an ivory tower of development but rather be a free man staying in a small hut. We are not asking development or even democracy what we want is to live a free men and die a free men even though we may be poor and wretched. Neither your development scheme prevails or democracy establish as the narco production will not lack until and unless it is tackle at the source of it by listening to the local leaders and giving them a better choice. It’s time to rethink you foreign policy objectives in Burma.